Bluelab Combo Meter The Bluelab Combo Meter is a portable all-in-one nutrient, pH, and temperature m.. The 'Plant Safe' green LED's constantly displays the three critical nutrient parameters conductivity.. Replacement probe for Guardian Monitor Combo Meter and Bluelab pH box meter. Easy to clean Fully wa.. The tool of trade for measuring nutrient levels. 5 year gaurantee. Self calibrated, all you need to .. Buffer 4.0 calibration fluid for pH meters.. Storage solution for pH meters. If it dries it dies is a common phrase used with pH meters. This flu.. Basic EC meter. Highly accurate and easy to read. Carry case with belt clip included. Built in therm..
HYDRION pH Paper 5 Meter roll. 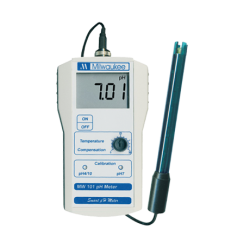 Large Screen Thermo Hygro IN and OUT Temperature probe. Quality and accurate IN OUT..
Lux Tester Meter High accuracy in measuring. LSI-circuit use provides high reliability and durabilit..
Milwaukee COMBO MW302 EC and MW100 pH Meters with carry case. Standard portable meters with no frills! Milwaukee’s durable meters for quick and reliable measureme..